Who doesn’t love mac and cheese? It’s obviously a favorite of nearly every kid alive, but us adults have the luxury of stepping away from the blue box and really getting down to business with the real deal. Despite the fact that it’s summer and nearly 100 degrees here in Chicago, I couldn’t resist the urge to stand over the stove and make a batch of creamy mac and cheese. Pungent gruyere, salty Parmesan and bitter mustard greens all come together with pasta to create something completely indulgent and comforting. If you’ve never put greens in your mac before, you have to try it. It helps set off the richness a bit, which makes me feel a little less guilty about the whole thing. But honestly, I’d feel much more guilty eating the stuff from the blue box. 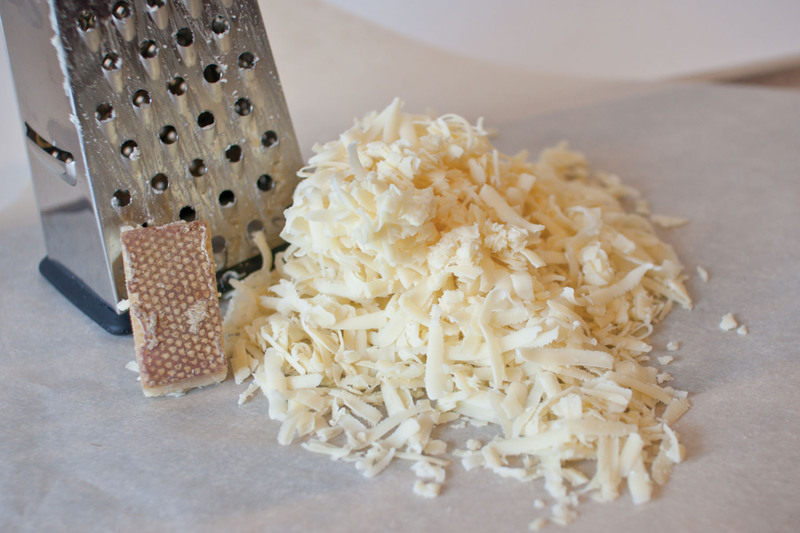 What’s really in that powered cheese, anyway? 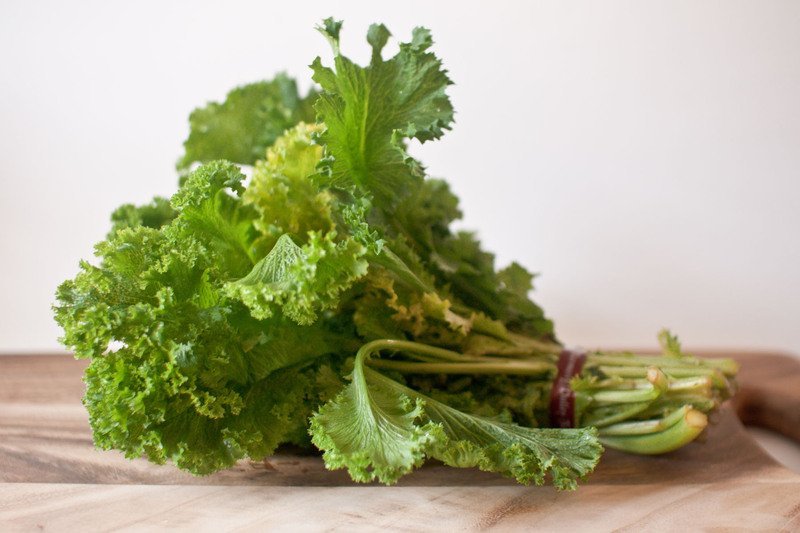 In a large pot of boiling salted water, blanch the mustard greens for approximately 1 minute. Drain and immediately rinse with very cold water. Squeeze all the remaining water out of the greens with a towel, chop greens into half inch ribbons, and set aside. In a large stock pot, melt butter over medium heat. Add shallots and cook until translucent; approximately 5 minutes. Sprinkle flour over shallots and whisk for approximately 2 minutes or until the flour has turned a nutty brown color. Whisking constantly, slowly add 2 cups of milk. Once combined, add the remaining cup of milk, plus the cup and half of half. Raise the heat to medium-high, add cayenne, nutmeg, salt and pepper, and whisk constantly until the sauce comes to a boil; about 8 minutes. Reduce heat to medium-low and stir sauce occasionally until thick; approximately 15 minutes more. Add chopped mustard greens, gruyere and Parmesan; stirring until the cheese has melted into the sauce. Taste and adjust for seasonings if necessary. Add cooked macaroni and stir to combine. Serve topped with freshly cracked pepper and a sprinkle of Parmesan cheese. Drugs. Or else alot of some sort of sugar. 🙂 I don’t know what’s in it but I have been known to sit down and eat a whole box of it like a starved wild animal. I’m liking this recipe. Don’t think I’ve ever made mac and cheese with gruyere. Love the addition of a little cayenne and nutmeg. It’s amazing what a little fresh nutmeg can do to a dish. Sinful. I’m scared of this recipe. Thank you for the kind words, Gina! I’m glad you found me, too. oh cheesy holy yum!! might i suggest a light dusting of panko on top for a texture shift? And only if you have it, a loving drizzle of good truffle oil??? this is seriously one of my comfort foods that i would die without. PS. the blue box stuff is an absolute abomination of anything that could be called food. that being said, i do tend to keep one and only one in the back of my pantry for those days when you’ve had just a little – or a lot – too much wine the night before. Then I eat it (shhhh, don’t tell anybody)…. and then i want to die. Love the mustard greens in here! Also, that plate is super cute. That looks like something I am going to have to indulge in soon! 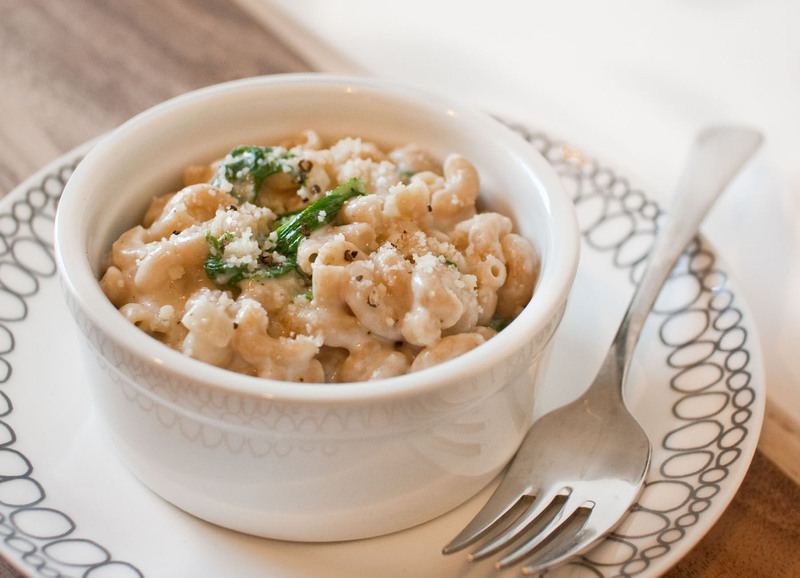 I’m so glad you love Gruyere mac and cheese too! It’s totally the right mix of texture, pungency, and creaminess…Definitely worth it, even in ridiculous summer heat. The addition of mustard greens is totally a great idea, too; I sometimes find pasta-only mac & cheese a little overwhelming. Yum! This is very very smart. Mustard greens have such a kick and bitter flavor, I’m sure it would go great with the rich mac n cheese. I ate sauteed mustard greens recently and was like ack! Too bitter! Next time I’ll try this. Thanks for the mac recipe variation. I always love a wholesome ‘the works’ mac & cheese. I will try cooking it today!